A new product by Actis, the Actis HYBRIS Reflective Insulation is a reflective insulation product based on a honeycomb structure. 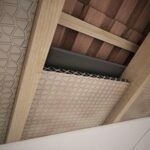 HYBRIS is an effective insulation material for ceiling applications, pitched roofs, masonry walls, and timber frame. The Actis HYBRIS Reflective Insulation is available in a variety of thicknesses ranging from 50 mm to 205 mm. The panel width is 1145 mm. 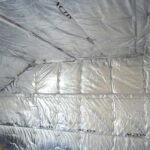 This insulation choice provides a high thermal performance enabled by a special structure consisting of a large number of low emissivity cavities. These are protected from both dust as well as excessive air movements. Additionally the low emission external films provide extra thermal resistance. Good insulation is more than just a matter of thickness. Actis knows that offering long lasting results is essential which is why they now manufacture all of the components in house and rigorously field test each item to guarantee top efficiency. A comprehensive dual assessment system ensures the airtightness of every product and the Actis HYBRIS Reflective Insulation is no exception to this rule.